I have a love-hate relationship towards my hair throughout my teenage years. Having a thick and wavy hair might be a blessing to many people, but growing up, I never knew how to deal with it. Before the internet, there is really no one to let me know the do's and don'ts, and which product to buy and use. I used to just wake up and go to school with frizzy and static lion hair every day. Hair dryer made my hair even frizzier, so flattening iron was my only option. I didn't know how much work it takes only to maintain my hair in a normal state. After so much time researching on the internet and having the first-hand experience of over-processed bleached hair, I feel pretty well-occupied on all the information about hair care. I mean, just to keep it not breaking after being colored and bleached, there are so many lists I need to keep in mind and often neglect, such as: using curling irons too much AND without heat protector (double mistake! ), using the wrong shampoo, brushing hair when it's wet, even small things that sounds trivial; like tying my hair too tight, not picking the right pillowcase and hair towel (yes, I just knew that normal towel can cause split ends when your hair is already weak, you guys.) Only after having my hair state on the very last straw of its existence, I started consciously reading through the ingredients and the reviews of everything before trying it on my hair. To treat a frizzy and static fly-away hair, first you should know the cause. It's caused by a dry, dehydrated, open cuticles in your hair. Your hair is so thirsty, it is trying to fly away from your head, to catch moisture on the air. It's literally THAT. What could be the cause: your hair dryer being too hot, and you don't moisturize your hair right. So here I am now, being 'woke' about hair care and reviewing this fancy, and I should also say, underrated, hair dryer. While normal hair dryers simply does its purpose of drying hair and taking all the moisture away (leaving the unpleasant volume, fly-aways and frizziness afterwards), the newer version of hairdryers did an upgrade of putting negative ion to hair to make it look smoother. But instead of negative ions, this new EH-NA98 nanoe hair dryer from Panasonic uses nano-sized electrostatic atomized water particle (that's a scientific word for 'super duper tiny, microscopic, almost invisible, droplets of water', you're welcome), which is around a thousand times smaller and more effective than those modern hairdryers who claimed to use negative ions. OK, so now that we know what’s technically happening inside this hairdryer, let’s talk about my real experience. First of all, one big change I noticed about this Nanoe Hairdryer is how it relaxes my frizzy hair texture. Here is the huge thing: I didn’t even brush my hair during the whole drying process. Yes, I stopped brushing my hair when wet because of how damaging it could be on my fragile hair, so I just used my finger to lightly separate my hair when drying, and I’m so surprised to see how flowy, relaxed, and tangle-free my hair feels, as if I just used very expensive hair salon treatment and products. Also, another surprise, after leaving it for 3 days, my hair is STILL voluminous and shiny and not limp and oily yet. Can I treat my hair kindly now and letting it heat-free? Yes. I wish I knew all my problems with hair can be solved with moisturizing and the *right* hair dryer, instead of damaging it even more with hot iron. In conclusion, this hairdryer is the yin and yang that all types of hair need. If you have a curly, frizzy, dry, or heavily processed hair like mine, this nanoe hairdryer will relax your hair texture and treat it gently. If you have a straight, fine, limp and oily hair, this nanoe hairdryer will fix your scalp’s oiliness and give it a boost of volume that stays. It’s an ultimate beauty-for-all tool that balances everything your hair needs. Bonus point: they have these extra buttons that said 'scalp' and 'skin', turns out because the nano particles can also be used to hydrate your dry scalp and face skin. Now you get why I said it's underrated. 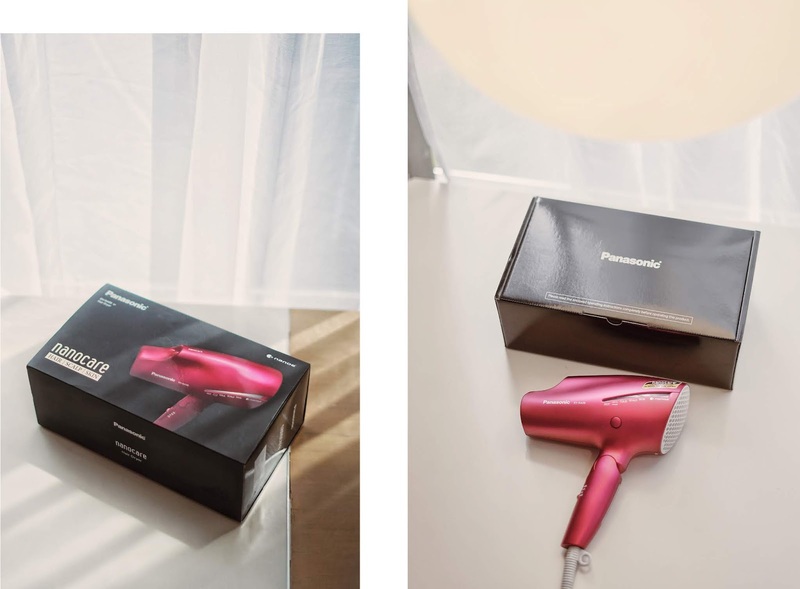 With that being said, this hairdryer tackles any problem in one stone: with its stable temperature and the advanced nano water particle technology that moisturizes and repair your thirsty, opened cuticles on hair, scalp and skin while drying it. So don't just dry... Beautify. Good review, but I prefer my Karmin dryer I love it.